As my close friends and family know, I am fortunate enough to be able to work from home… Very often… How can you blame me when you can roll out of bed in an xl sweatshirt and sweatpants at 7:55, brush your teeth (I feel like people can somehow tell if you have or not over the phone), and be online by 8:00?? It’s the best. Just be extra sure that your video isn’t turned on during a Skype call! Most importantly, any of the time I would’ve spent brushing/curling my hair, putting on makeup, and changing into something that wasn’t previously owned by my dad and also didn’t contain 98% lycra, can be spent on the most important meal of the day. 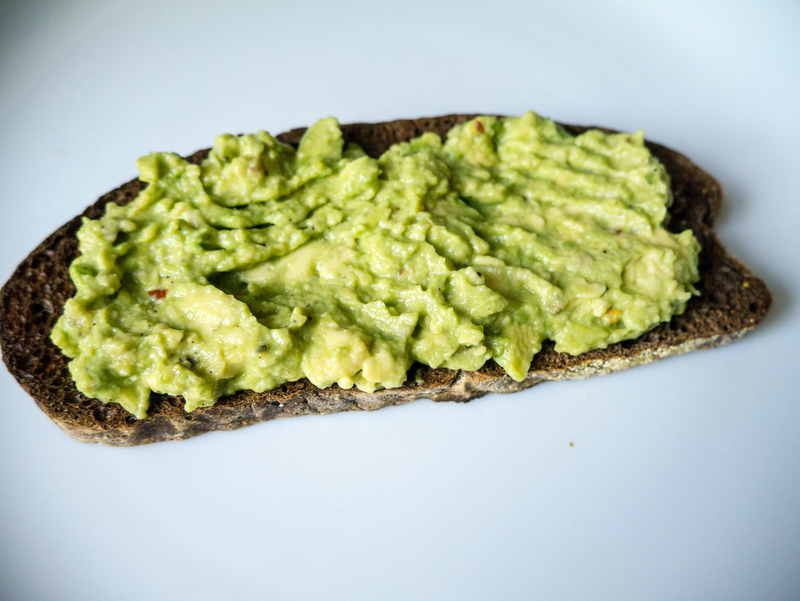 As basic as it is, I love a good piece or 3 of avocado toast. Side note, have you ever tried explaining the term “basic” to a non-millennial? Good luck. 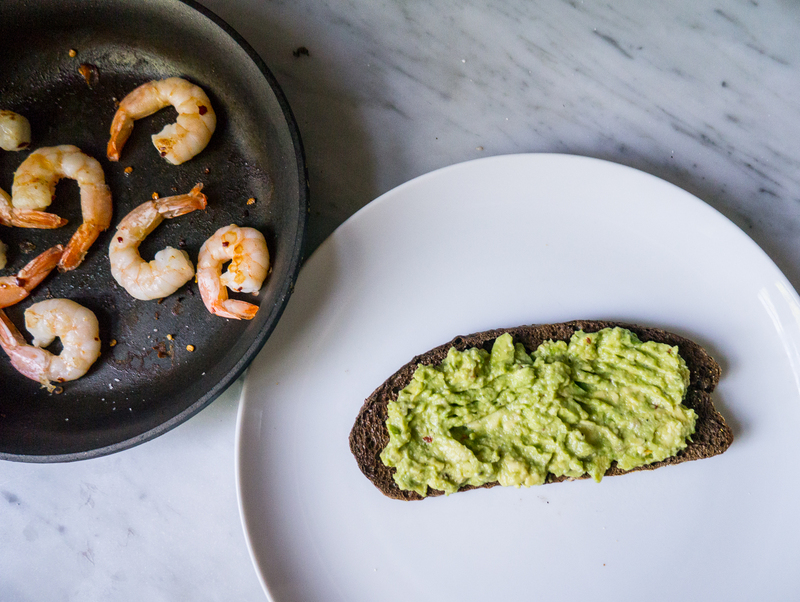 Anyway, avocado toast is my preferred way to start the day, and I’m always looking for ingredients to change it up. 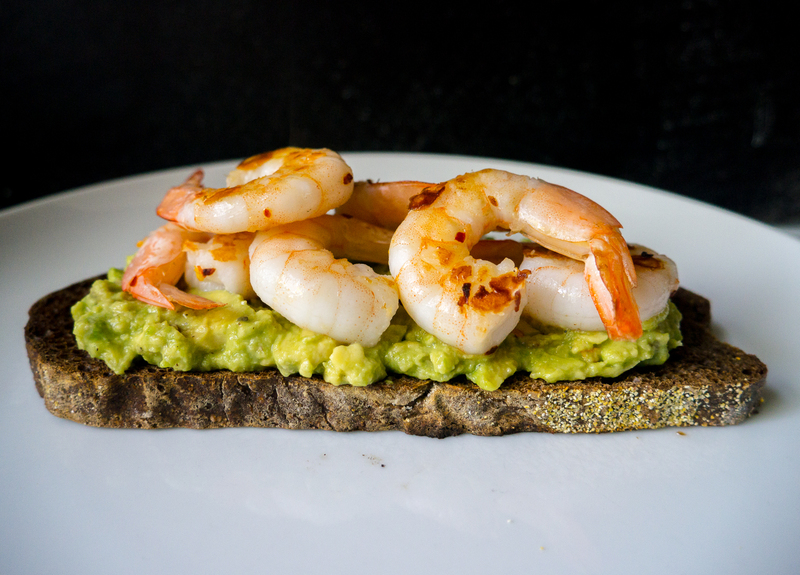 Somehow an early morning forecasting call inspired me, so here you have it ladies and gents (drumroll please), the ultimate variation on the breakfast classic, spicy shrimp avocado toast! I’m hearing some of you quietly whisper “ew” under your breath at the idea of seafood before noon, but trust me when I say this is the BEST breakfast/snack/lunch/anytime meal. 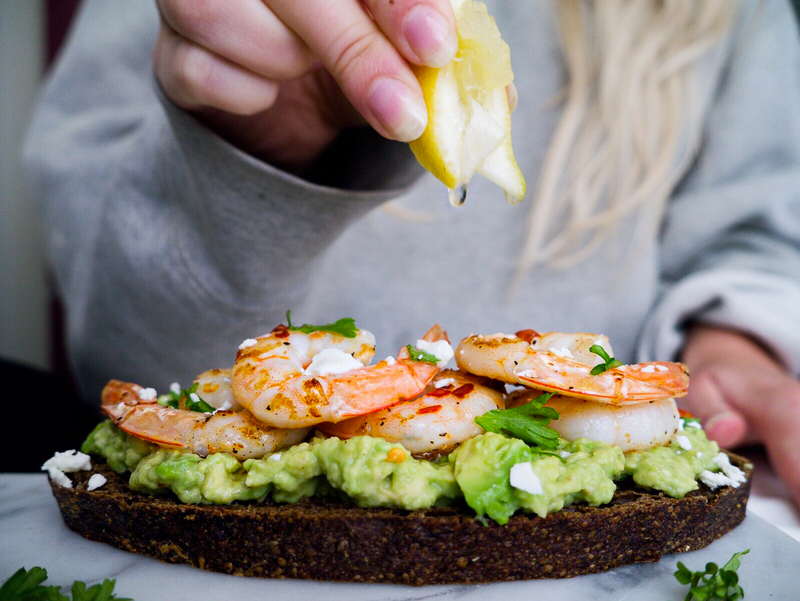 The shrimp add a perfect amount of briny flavor to the toast and a great amount of protein, and the cilantro, lime, and chili reminds me of a big bowl of guac. What’s not to love?? 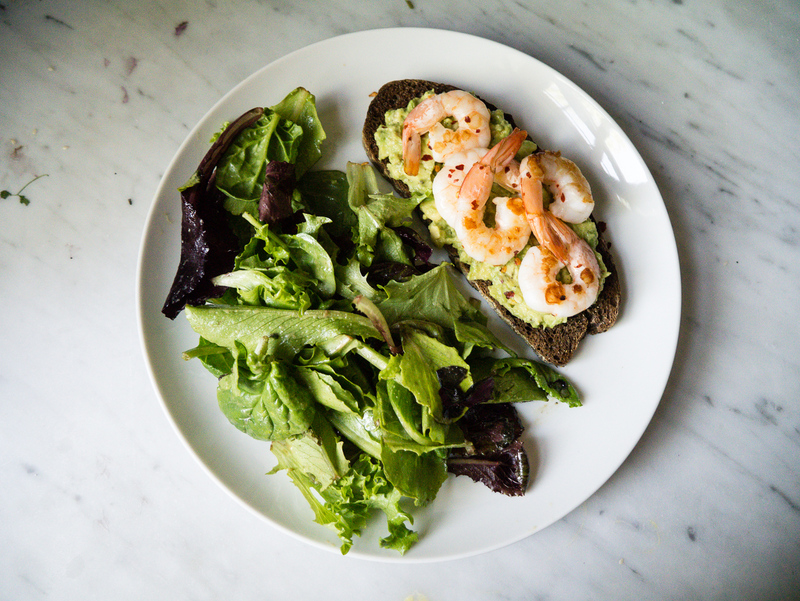 I serve it with a simple green salad for lunch, but it’s great on it’s own as well. 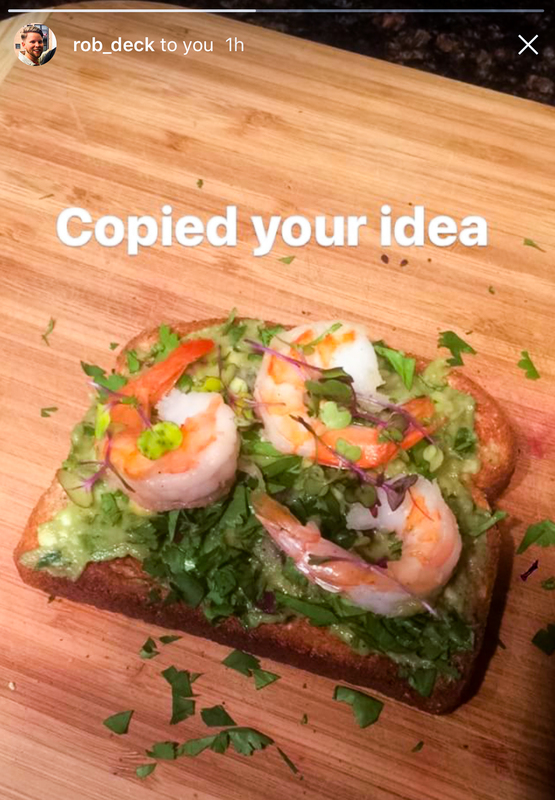 If you try it (and you should) please tag me in it so I can see 🙂 Also leave a comment below if you have a favorite kind of avocado toast so I can give it a try! Heat a pan to medium high heat, and pop the slice of bread in the toaster on your preferred setting. 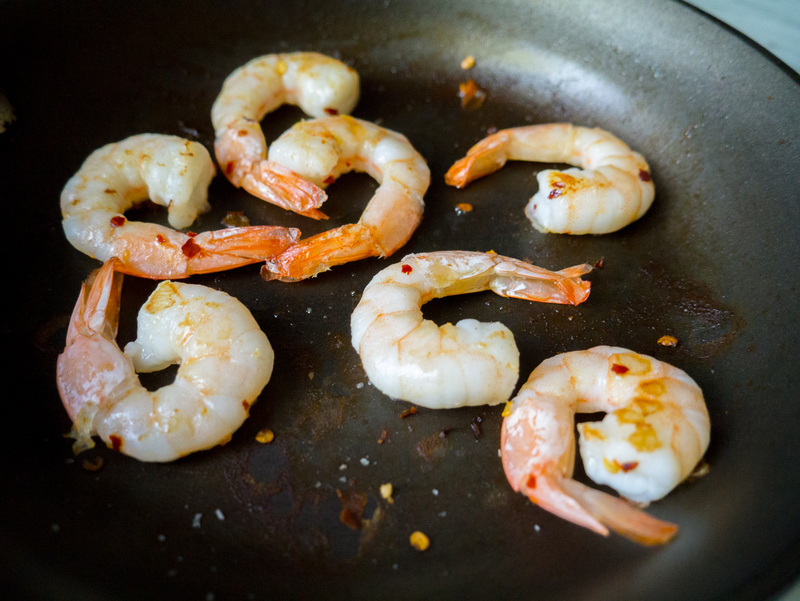 When the pan is hot add a little oil, and saute the shrimp with a good shake of chili flakes, salt, and pepper. Remove the shrimp when they’re caramelized on the outside, and cooked all the way through. Scoop out the avocado into a bowl, and mash with a generous squeeze of lemon or lime and a pinch of salt. 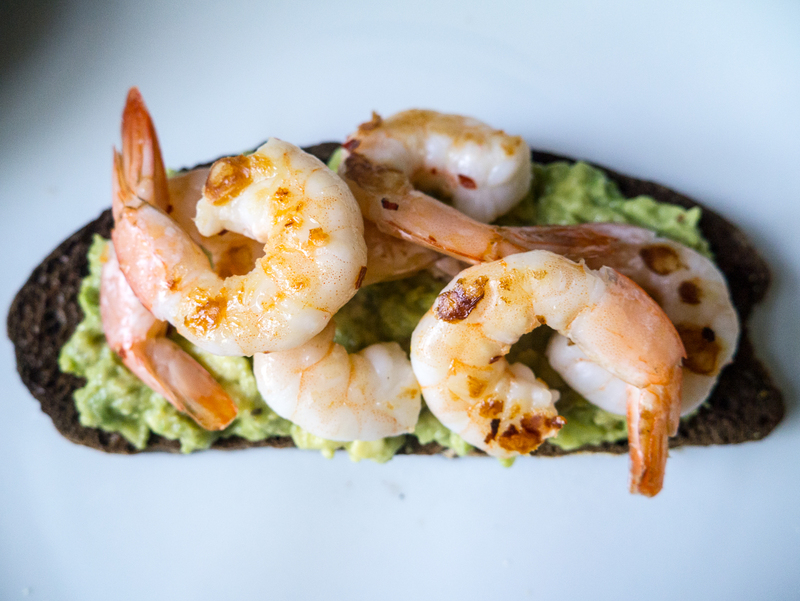 Dollop the mashed avocado on your toast, and top with shrimp, queso fresco, and cilantro.